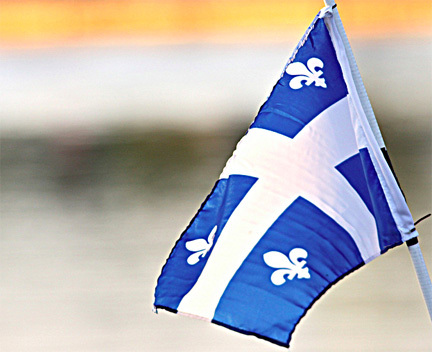 I left Québec in 1988 to explore the west. To me, my plans was just to explore, to learn English, and eventually return back. Well it didn't quite work that way. I did learn English, met wonderful friends and I found love and stayed. 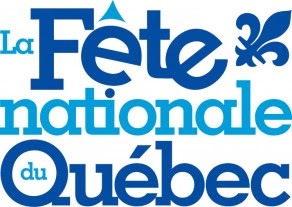 Although I decided to stay in the west coast, every year on this day, I make a point to honor my roots by listening to Québec singers and raising my glass to all... Québecers. There's one device I always wanted on my Fashion Mate 257... a stitch counter. I've seen this on electronic machines and it counts every stitch you make. It's fun. Like an old car with a speedometer that show's you the mileage. Of course, they never included this on the old machine but it would be fun to know how many stitches my old machine has accumulated over the last 40 years. One things for sure, if you want your Fashion Mate working well, is to clean and oil it often. Afterall, it's all metal and rust is your enemy. This is how I keep my baby purring! Remove the two screws on the top plate and the one screw that holds the side plate. Remove needle and foot to gain better access. Your 257 will look like the image above. Then remove the back plate behind the foot. 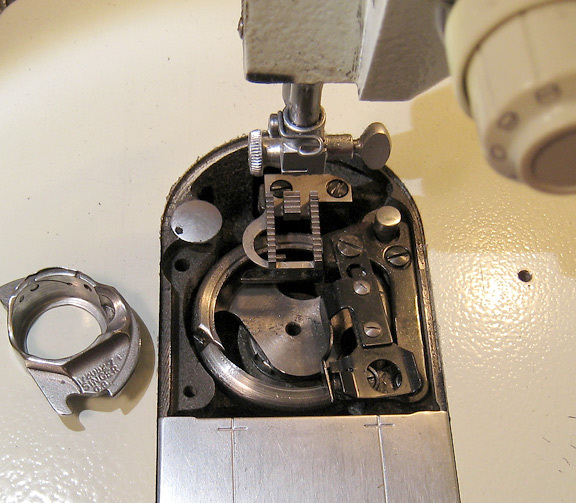 Lift the bobbin locking arm (black metal), gently with a screw driver (image above), lifting it aside to get access and to remove the bobbin assembly. Now, you are ready to dust. You can use a stiff paintbrush or I have found that there's nothing better to remove the dust than a little blow of compressed air. Note: because this area seems to hold so much dust and the paintbrush doesn't reach properly, the compressed air rules. Now, if I had the luxury of an air compressor, but I don't, I would use it. A can of compressed air works just fine. You only need a small amount. When ONLY the Dust Off will do! 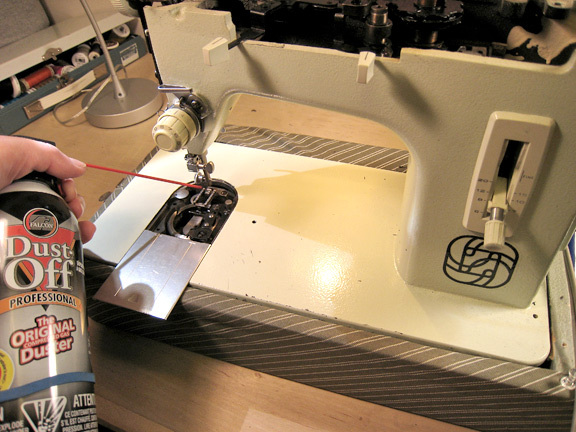 After you finish the dust off, remove the excess old oil and thread with a clean cloth. Make sure you rotate the wheel so you don't miss any hidden thread in the back. Now you are ready to oil. I oil every moving part. How do you know? With the machine open (top plate off to access) and with light on, I start from the top of the machine. Press the pedal gently, and observe which parts are moving. Then stop and place a drop of oil on every moving part. Once this is completed, screw back the top and side plate. Now it's time to oil the bobbin mechanism. Your machine should be looking nice and clean, put back the bobbin holder and plates back together. Press the pedal to make sure all the oil is distributed evenly throughout the mechanism. The bobbin assembly is the MOST IMPORTANT place to oil. If you don't have the time for an overall clean job, at least keep this area oiled at all times! At this point, you're almost done. 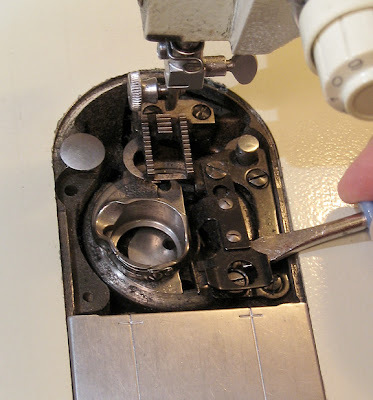 The last step is to look underneath by tilting your machine and looking at the bottom mechanism. I press the pedal gently making sure NOT to have your hand caught anywhere. It may not be the safest way so please be careful. I find that it's the only way to view the moving parts and to oil it. This is also a good time to inspect the belt for wear and tear. 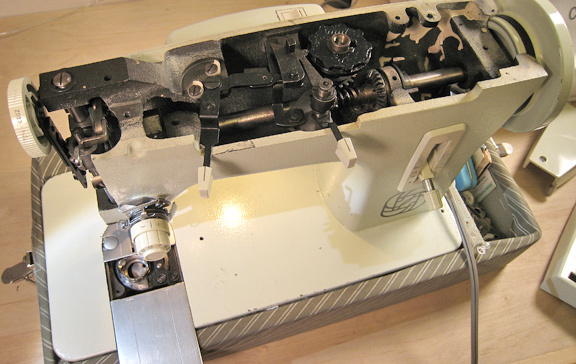 Now, you are ready to close the machine and place it in it's original sewing position. Here's the fun part... put your pedal to the metal and make it run for a few seconds at maximum speed... it should PURR! I leave my well oiled machine over nite, it seems to like it and the next day I use a scrap piece of fabric to start with. THERE WILL BE SOME OIL RESIDUE. I've been cleaning and oiling my machine this same way for many, many years. I guess I'm doing something right, because my machine is working as if it's brand new. So keep on sewing and enjoy a clean and well oiled Fashion Mate 257!